Update: Turns out that the phone is nothing more than a concept device. Move along people, nothing to see here. Following the announcement of the Nokia N1, the company's first Android tablet after the Microsoft deal, now we hear the Finns are working on a phone running Google's mobile OS. The phone is dubbed simply C1 and an alleged product shot of it popped up. Alongside it, there's also a rumored spec sheet, which includes an Intel-made chipset with 2GB RAM. The Nokia C1 would sport a 5" display, probably of 720p resolution, and have 32GB of storage. At the back, there is believed to be an 8MP camera joined by a 5MP one at the front. The Nokia C1 will launch with Android 5.0 Lollipop garnished with Nokia's Z Launcher, just like the N1 tablet. It will be manufactured by Foxconn, since Nokia is prohibited from manufacturing devices until 2016 as per its acquisition contract with Microsoft. There's no information regarding availability just yet. 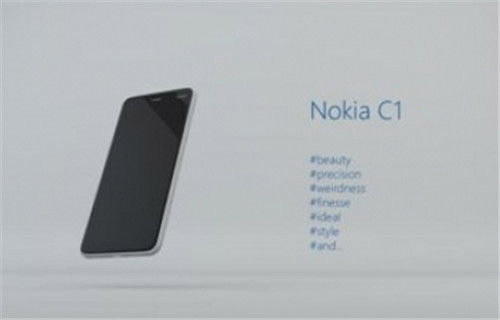 We suspect Nokia will announce the phone in the first quarter of 2015, but we're yet to see and hear more about the C1.